Reports from Swansea, Boston, Sydney, Calgary, Conferences etc. College Swansea for many months. making any worthwhile contributions of his own. this is little more than a facade. whether of staff or students. and give their active support. greater than it ever became here. cannot easily be duplicated elsewhere. struggle, this is hardly possible. being the less important one. they will not be successful. enables the expression and developsociety generally. issues in that way again. radical social change, and parti’John Baker and Kai Ni$lsen. journal will not be long delayed. One of the main problems radistarting off the discussion. tical role, if any? The Newssupervision of John Burnheim. illustration of the problem. Disof the former than the latter. positive doctrines of its own? To what extent should it be conLondon. staff and students in the other. was the discussion group on Exams. dwindling flame of student radical- sophistication. 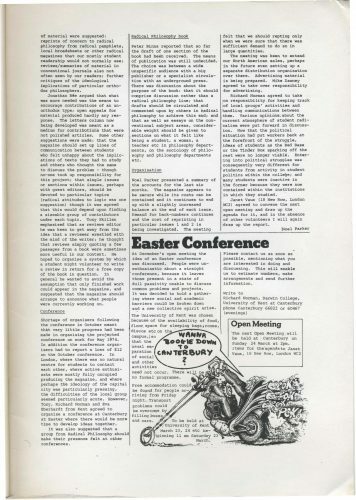 ference, scheduled for Easter 1974.
a particular theme, that of ‘Work’. for granted in the audience. in putting the conference together. Square, London on 15 December. Norman agreed to take the chair. more than usual a floating membership that had not attended before. implications of particular orthodox philosophers. of the book in question. conference on work for May 1974.
time to develop ideas together. of publication was still undecided. publisher or a specialist circula: tion with an underground press. balance at the end of each issue. and a new collective spirit arise. , in which they studied. Sunday 24 March at 2pm.